After a long morning at Longwood Gardens we headed over to Delaware to see the Winterthur Museum (incidentally he was somehow related to Longwood, a cousin of some sorts). We thought that Longwood Gardens was extravagant (he had built himself a waterfall! ), but were we ever in for a surprise. Extravagance seems to run in the family. We thought we were going to an old house full of old stuff like pottery and furniture. The kind of stuff you look at and think “oh that’s cool” and you forget about it later that day. We did not at all expect, first of all the size of the property itself. Just walking from the visitor’s centre to the house took close to 45 minutes, they actually have a shuttle bus. 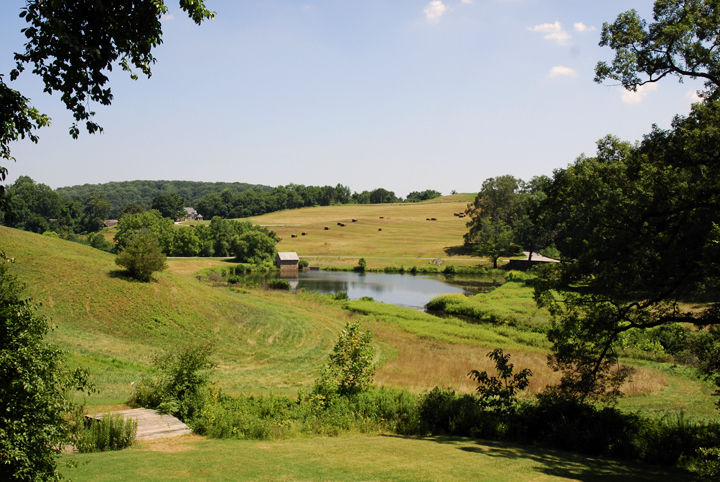 The above image is of one of the many pastures on this guy’s land. He had enough room for a giant house and all this surrounding land, it was unbelievable how much land this family owned (just look at the small house at the top of the lake for a reference point in terms of scale). The house itself was also enormous, partly because the kept expanding it. And then he would acquire more stuff to his textile/pottery/furniture collection and thus have to expand his house yet again. In the end, from what I remember it was 5-6 storeys high, had an elevator and was expanded multiple times. We only saw a small portion of the collection (even still it was a lot of stuff) and wandered the grounds. This took us almost 3 hours. And we were exhausted, I mean fall over into an instantaneous sleep wiped out. Never underestimate a museum or a garden, they might sound like a nice light fun activity and wear you out!